I guess it is a bug or a test, because after updating, I get 17.00.88. @spwolf: why? Those who ask, often get… thats life We do give out licenses or extend them to people who report interesting bugs. I’ve asked, and am still waiting for any response regarding the license…. @brian-gregory said in Fast Ring: PowerArchiver 2017 17.01.06: So you’re just NEVER going to tell me how to do it??? If you use Options> Export to local file, it seems like everything gets saved. Can you tell me what settings did not get restored for you via Cloud? @Brian-Gregory so in one of the latest versions we now clean up old program group, rename it to PowerArchiver and also delete old shortcut to PA 2017. So now when you upgrade from 2017 to 2018 all is nice and proper on Windows 7 and earlier system. Thanks! 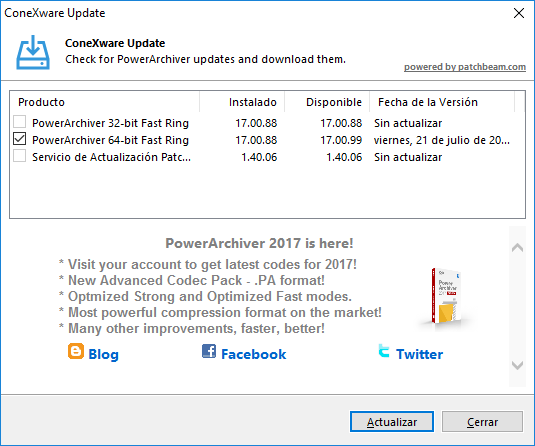 Slow Ring: PowerArchiver 2017 17.00.90/91/92 - Final! On my desktop it got a bit muddled up because, I think, I checked manually for updates at the same time as it was updating itself. On my laptop I let it do it’s stuff and it seemed to work well, I think it updated when I closed PowerArchiver after using it. @pirrbe interesting, i reproduced it on add window. @drteeth thanks for letting us know.